The turbulent tragic teen romance of Michelle Carter and Conrad Roy that shocked the nation. Based on the real life mystery surrounding the death of Julia Law, a young paralegal whose body was found in the apartment of her boss and lover, a prominent Philadelphia lawyer. Was it murder or something more complicated? I question the motives of the writer/producer. The movie seemed designed to cast doubt on Michelle carters conviction for manslaughter. For those of us who read the actual progression, through trial transcripts and the mind-boggling amount of texts aggressively shooting down Conrad's every small attempt to change his mind and live. There is no doubt. She knew where the victim was when other people, including authorities, were looking for him and lied to people that asked her about his whereabouts. If this was a criminal case and the victim was a criminal being charged for a crime, she'd be held liable for obstruction and potentially interference. The victim could have gotten help from someone else if she hadn't lied to others but, instead, she knowingly lied with the express intent to make sure that he didn't get help so that she could continue to convince him to kill himself. That makes it pre-meditated which is what makes it fulfills the condition of criminally negligent manslaughter. This movie seemed designed to show Conrad Roy in a negative light and downplay Michelle Carters role in his death. For example, in almost every scene, that's not right inside his home/school we see Conrad smoking a joint and stupid high. (Where did that information come from?). His accomplishments, such as getting his Captains licence seem glossed over ( quickly), and the focus is put on how he is a mentally ill stoner who wants to die. Michelle get the reverse treatment. Although they do show her as a young women gripped by anorexia, losing friends over her neurotic need to elicit constant attention for from them, they also leave a whole lot out regarding how psychopathic she really was. For instance, they totally skip the fact that she was trying to be the grieving girlfriend to emulate the lead role in her favorite show "Glee". 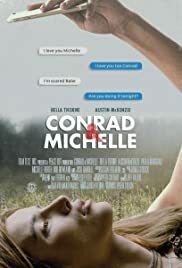 Conrad died on the exact same date as the character's boyfriend (which explains her urgency that particular day), and Michelle actually quotes that actress, word for word, when faking her grief to friends. This movie seems to have relied heavily from the point of view of the wack job "Dr" testifying for the defense, who was the laughing stock of the trial. At least she did go to jail,( finally FIVE years later! ), and is currently serving her piddling 15 months.